This is the time of year to start putting away those jeans and start pulling out those sundresses. 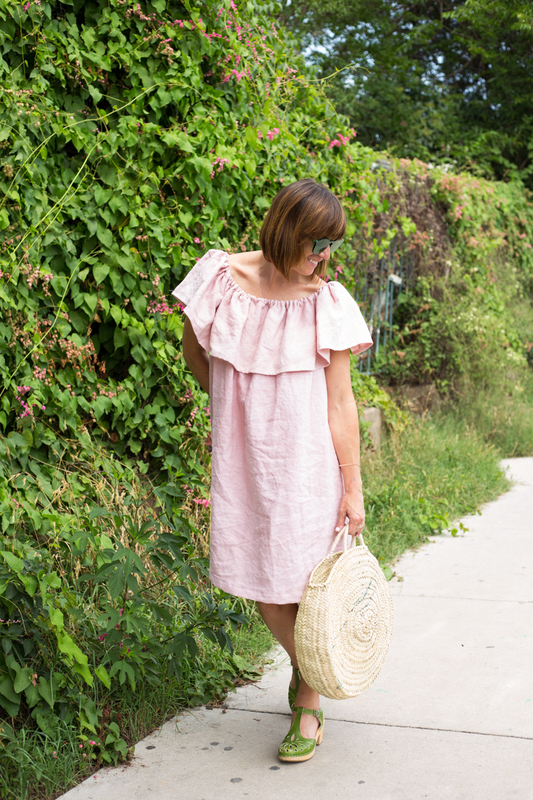 Last week, I made this ruffle top linen sundress in a flurry of last-minute sewing. 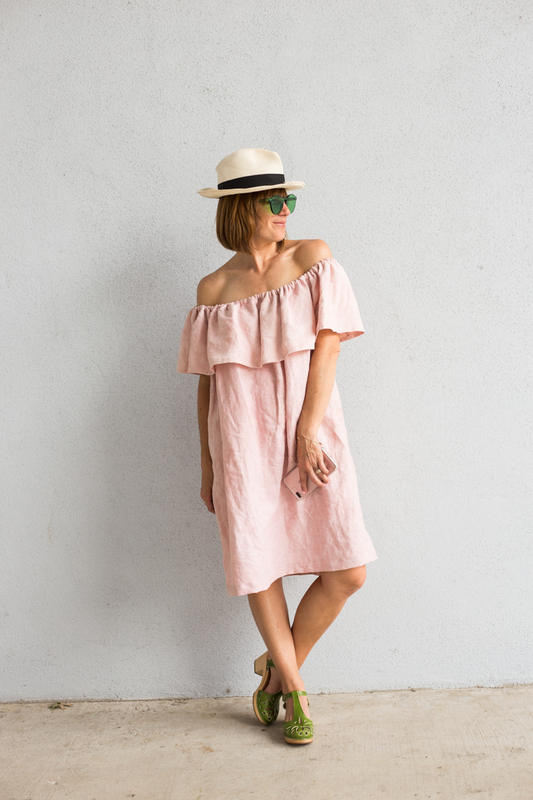 It is basically the perfect Summer 2017 dress, hitting all the trends: millennial pink, bohemian linen, flowing ruffles, and the optional off the shoulder look. This dress takes me out of my own comfort level a bit, and I am already liking the new me! Read on for the full tutorial as part of Melissa‘s Sundressing Series. 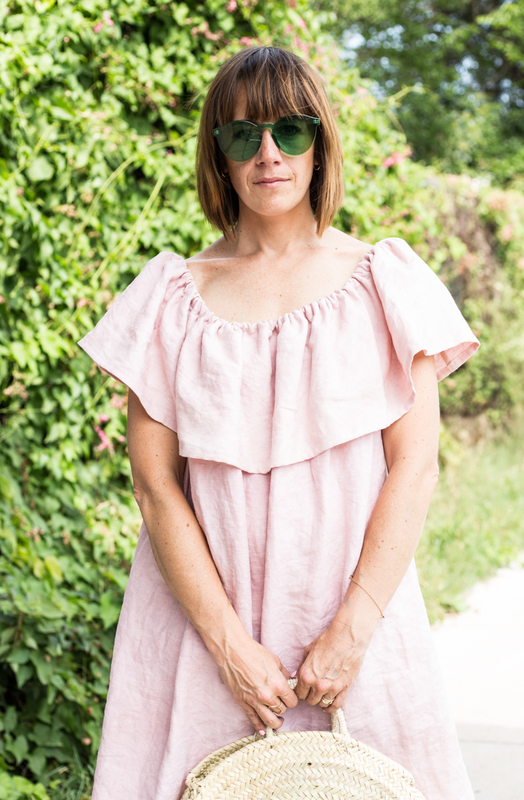 I have participated in Melissa’s Sundressing Series for the last few years and really love the push it gives me to make something for the season. 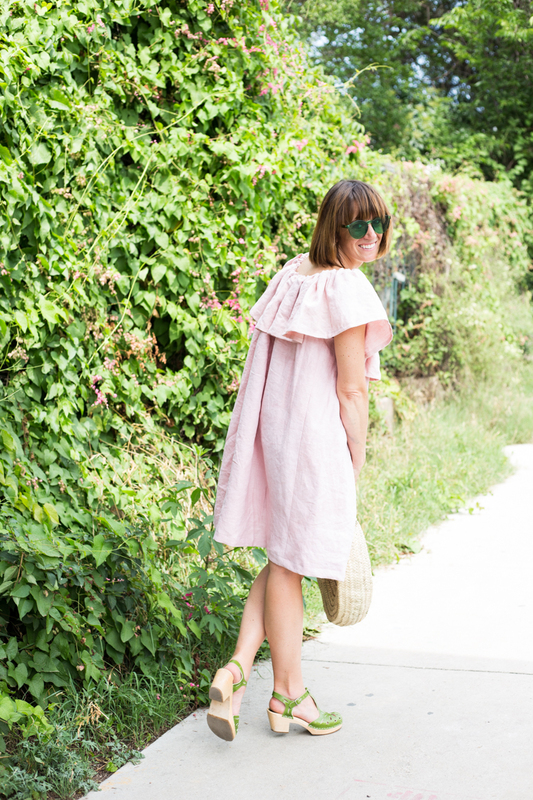 Three out of the four dresses I have made became instant favorites (this striped drawstring dress, this braided maxi dress, and today’s ruffle linen dress.) And one of them sort of struck out (this drop waist dress), but hey. Live and learn, right? As I was deciding what to make this year, I really considered what I’ve been wearing a lot of, which styles of dress get pulled out of my closet again and again, and what materials I had on hand. After a short and sweet survey on my Instagram Story, I settled on dyeing some white linen this beautiful dusty pink (with avocado pits! watch for the DIY on Friday!) and then turning it into a simple ruffle top sundress. 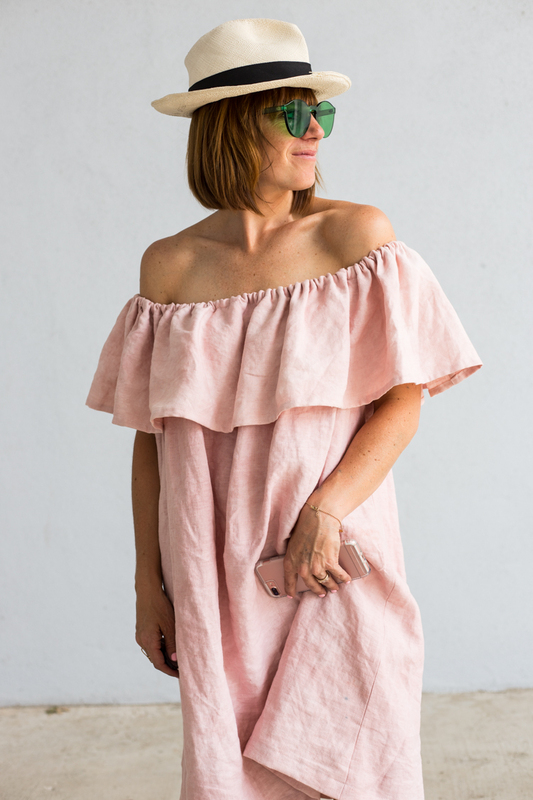 This ruffle top style is everywhere right now, and seems to only be gaining popularity. 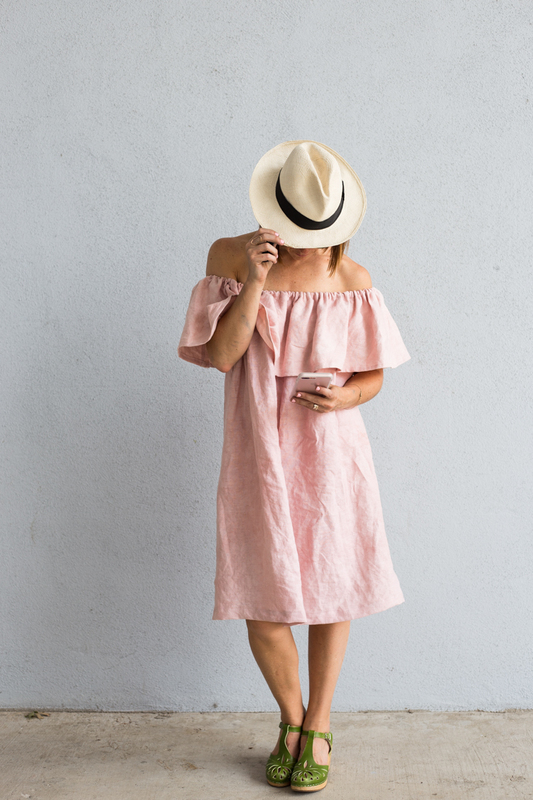 What better time to jump on the train, and with a dress that is as easy to make as it is to wear. 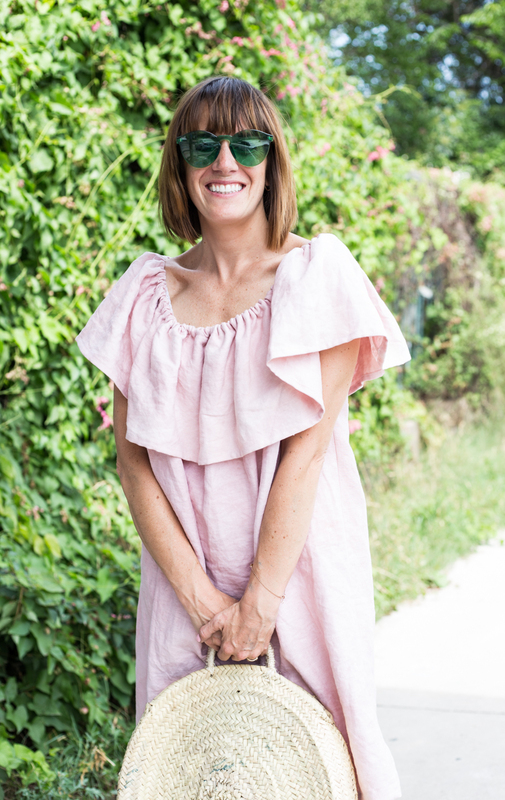 While usually worn off the shoulder, I also like the style with the ruffle pulled up along the neckline, creating fluttery sleeves for some of us mamas who prefer a little more coverage in daily dress. There are only four rectangular pieces that go into the dress, making this project really simple for even a confident beginner. When pulled down off the shoulder, the look gets a little more glam. I would love to wear it like this at the beach or pool, or on that Mediterranean cruise I’ve been meaning to take for a few years. With the easy fitting body of the dress, this style really would be flattering on any body type, and really wonderful for pregnant and nursing moms. Really an all-in-one type of dress. I told you it was perfect, right? 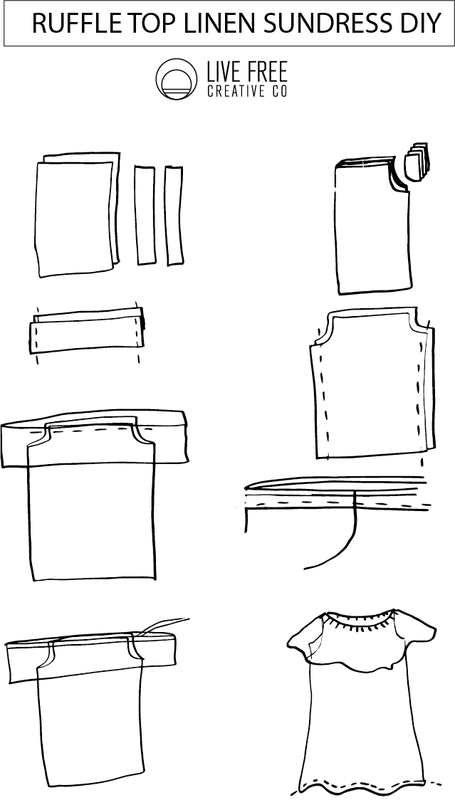 Measure the length from your underarm to the desired hem, add 3″. This will be your length. Measure your bust circumference and multiply by .75. This will be your width. Use those measurements to cut 2 rectangles of fabric for the body of the dress. 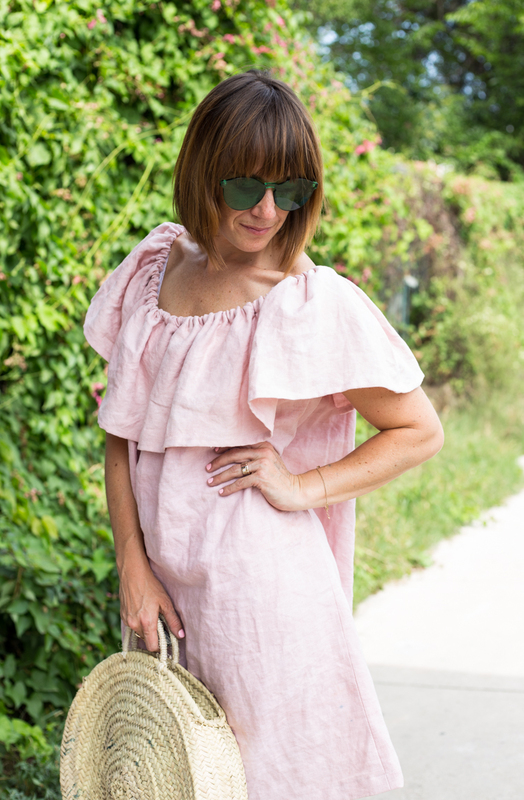 For the ruffle, cut two rectangles the length of your bust circumference, and 10″ in width. Fold the body pieces in half lengthwise and measure about 3″ over and 6″ down from the raw corner, and cut a shallow curve for the underarm. This doesn’t have to be perfect. Lay the two ruffle pieces right sides together and stitch the edges with a 1/4″ seam allowance. Finish with a serger or french seam. Lay the bodice right sides together and stitch the side seams with 1/4″ seam allowance. Finish with a serger or French seam. Fold the underarm curve under 1/4″ and press. Fold it another 1/4″ and press, then stitch along the fold. Fold the bottom edge of the ruffle piece under 1/4″ and press. Fold it another 1/4″ and press, then stitch along the fold forming a hem. Find the center front and back of the bodice and mark with a pin. Find the center front and back of the ruffle and mark with a pin. Match the pins up with the wrong side of the ruffle on the right side of the bodice and stitch together along the top edge. Fold the entire loop of the top edge down 1/4″ and press (including where the ruffle runs off of the bodice). Fold the entire top edge down 3/4″ and press. Mark 2″ of the back center with pins, then begin stitching along the fold to create a casing for the elastic. Begin and end at the pins, leaving 2″ open for threading in the elastic. Wrap the elastic medium-tightly around your shoulders just above the bust. Use that measurement to cut your elastic. Using a safety pin or another threading tool, thread the elastic through the casing in in the top of the ruffle. Tie into a knot, then stitch through the ends to secure. Stitch the hole closed. Hem the bottom edge of the dress by folding the fabric up 1/4″ and pressing then 1″ and pressing. Stitch along the fold. Iron the whole dress, and even out the ruffles. Rock it this summer. 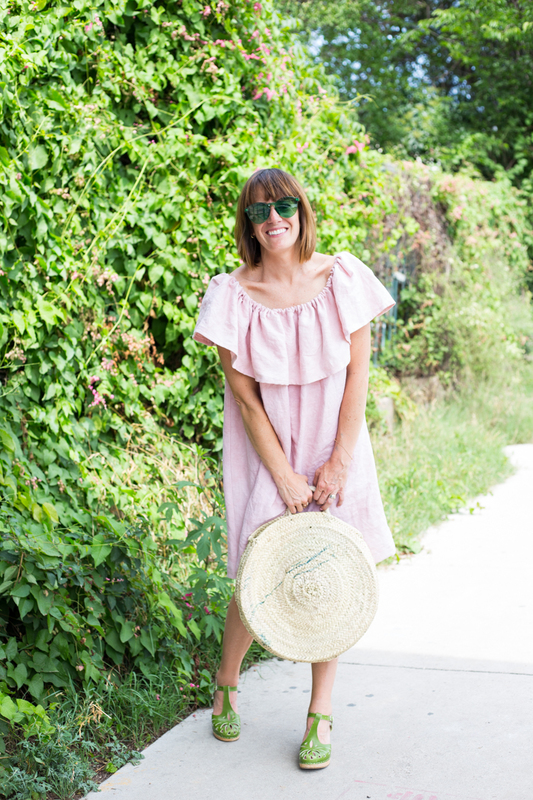 For new sundress inspiration everyday in June, check in with the Sundressing Series over on Melly Sews! For five dresses you should sew yourself, check out this post. If you’re gearing up for summer and want to cut some stuff off, here are my ideas of where to begin. Welcome! I’m Miranda, the maker mama behind Live Free Creative Company. Subscribe to my newsletter and get access to fun details, news, and behind the scenes!